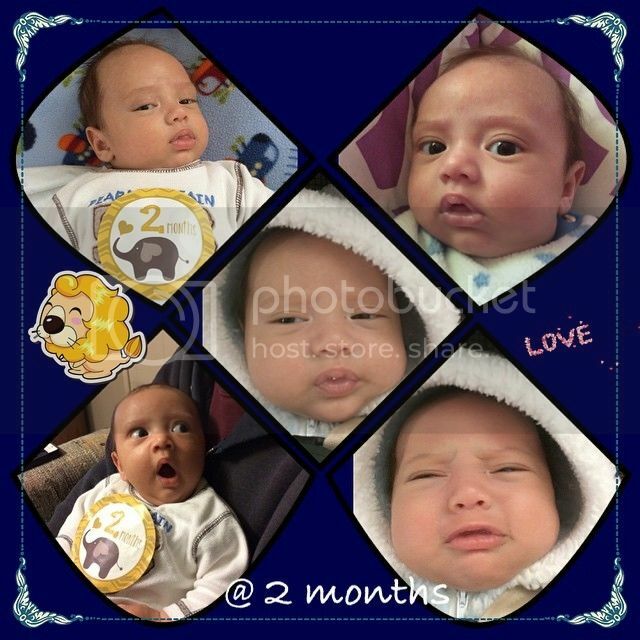 Yup, it's been a while since our son turns 2 months old. Time flies so fast, and as our his late Lola Judy says, they grew up too fast. There are so many unexpected and sudden loss that happens in my husband's family. A birthday celebration as well as a death of my beloved Mother in law. She was a very wonderful person inside and out. Amazingly wonderful with an unselfish heart. She will be missed and we all loss, such an amazing woman in our life. I guess, that terrible thing happens to an amazing person. However, life must go on and even though it is very hard to step forward, we have to do it as there are people who still needs us on earth. Life is so short, it's our time to live it to the fullest. We also need to remember that there is life after death. Might so easy to say, yet so difficult to do. A week after the tragedy, we went to our son's 2 month doctor's appointment and, other than the cold, which was passed on by his older brother, our son is one healthy chunky [knock on the wood]. No vaccines as we decided not to give our children due to the experience we have with our oldest. Caleve is now weighs 12.9 lbs from 9.13 lbs a month ago. I am very sorry about the sad demise of your wonderful mother in law. Please accept my heartfelt condolences. May her soul rest in peace. Your son is very cute. May God bless him abundantly.